Photo courtesy of Beit Guvrin National Park. A cluster of some 500 caves and cave complexes, dug by hand over many centuries, is Israel’s ninth and newest Unesco World Heritage Site. 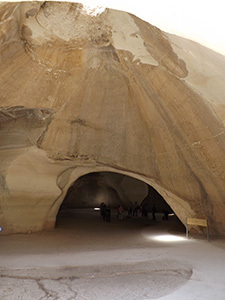 Totaling some 3,500 rooms, the caves—in Beit Guvrin–Maresha National Park, about 10 miles east of Kiryat Gat—have joined the Unesco list that includes the Taj Mahal and the Grand Canyon. The biblical city of Maresha existed between the eighth and the first centuries B.C.E. After abandoning Maresha, the population moved to the strategically located Beit Guvrin (1st to 10th centuries C.E.) nearby, which became the most important city in the Judean lowlands. The cave builders cut small openings through a shallow layer of nari limestone and then chiseled through softer layers of chalk. Some of the caves’ many uses were as stone quarries for houses; presses of olive oil, a major product of the area; dovecotes (which provided fertilizer for the olive trees); cisterns; and burial sites. The Apollophanes Cave, a burial cave with gabled niches, contains rich depictions of animals and humans. Inscriptions prove that it belonged to the Hellenistic town of Marissa (Maresha), where a few Jews also lived.